30-year fixed interest rates have hit a historic low today: 3.83%. I happen to live in the second hottest real estate market in the nation and am considering purchasing my first home, which would be my primary residence -- not an investment property. I intend on staying in the home for 7+ years. I am finding desirable properties are under contract within 12 to 48 hours of going on the market. Realtors tell me that there are lots of buyers shopping for homes in my price range. This seems to have increased prices several percent when compared to the 2008-2011 timeframe. I'm worried that I'll buy today, lose my job in a few years, burn through my 6-month emergency fund and be forced to sell my home. If interest rates increase, I suspect housing prices will decrease, putting me under water. How do interest rates affect real estate prices? One sees the rate drop from 14% to 4% and housing rise from an index of 50 to near 190. (reaching over to my TI BA-35 calculator) I see that at 14%, $1000/mo will buy $84,400 worth of mortgage, but at 4%, it will buy $209,500. 2-1/2 times the borrowing power for the same payment. But wait, my friends at West Egg tell me that inflation means I can't compare $1000 in 1980 to the same $1000 in 2010. The $1,000 inflates to $2611 (i.e. an income rising only with inflation, no more) and that can fund a mortgage for $546,900. This is 6.5 times the original borrowing power, yet the housing index 'only' rose 3.8X. See that crazy chart? Housing actually got cheaper from 1980 to the peak. Statistics can say whatever you wish. 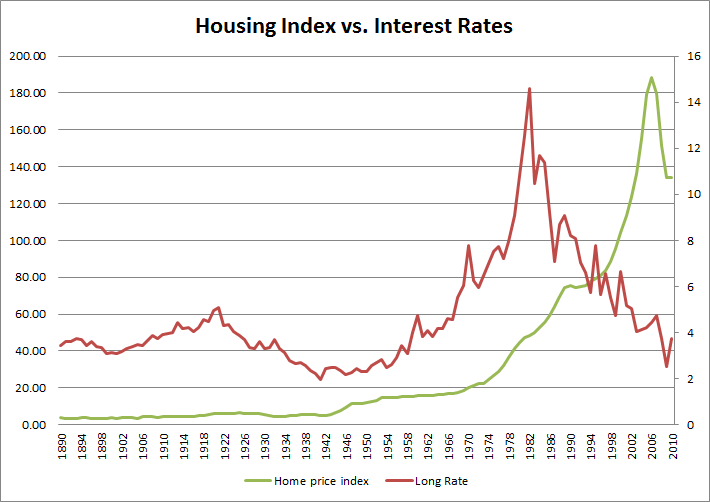 Interest rate change drove all the change in housing prices, but not quite as much as it should have. To answer your question - I expect that when rates rise (and they will) housing prices will take a hit. In today's dollars, a current $1000 borrows (at 4%) nearly $210K, but at 6%, just $167K. If rates took a jump from these record lows, that's the nature of the risk you'd take. Interest rates do generally affect house prices but other factors do too, especially the unemployment rate. However, everything else being equal, when interest rates drop, it makes the borrowing of money cheaper so tends to stimulate the economy and the housing market, increasing the demand for houses and generally causes house prices to increase (especially if the supply of new housing doesn't increase with the demand). When interest rates go up the opposite happens. Usually interest rates go down in order to stimulate a slowing economy and interest rates go up to slow down an overheated economy. Regarding your situation you are able to get a 30 year fixed rate at today’s interest rates (in Australia the longest fixed rate you can get is for 10 years and the rate is usually 1 or 2 percent higher than the standard variable rate. Most people here go for the variable rate or a fixed rate of between 1 to 3 years). This means that even if rates do go up in the future you won't be paying a higher rate, which is a positive for you. You are buying the house to live in so as long as you can keep making the repayments you should not be too worried if the price of the house drops sometime in the future, because if your house has dropped and you want to sell to buy another house to live in, then that house would have also dropped relative to yours (give or take). Try to put more saving away to increase your safety net from 6 months to 12 months or more, or make extra repayments into your home loan so that you are ahead if things do go wrong. If you are worried that you could lose your job, what can you do to reduce your chances of losing your job or increasing your chances of getting a new job quickly if you do lose it? Improve your current skills, get new skills, become an invaluable employee, or look at possible opportunities to start your own business. Do your own research on the types of houses you are looking at buying, the more houses you look at the better prepared you will be when the right house at the right price comes along, and the less chance that you will be rushed into buying what might be an overpriced house. So to sum it up; do as much research as you can, have an understanding of what your risks are and how you are going to manage those risks. Not the answer you're looking for? Browse other questions tagged united-states real-estate current-events home-loan mortgage-rate or ask your own question.